With a slew of heavy hitters under their belt, The Prototypes latest offering is no exception to the rule as they infiltrate sound systems around the world to drop two absolute tracks in their trademark sledgehammer style. 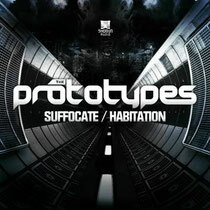 The Protos start things off in full-on uplifting spirits with ‘Suffocate’, a lesson in big room vocal led D&B. An ecstatic intro paves the way with delicate piano and a huge vocal that sets a precedent for the oncoming drop into peak-time performance D&B that’ll may perfectly at the front of any record box. ‘Habitation’ is a science fiction infused, turbo-charged journey into some nasty Prototype cyber-funk material. The weapon of choice for Friction of late, this one never fails to get ‘em going. Also look out for the digital format that includes an electro house remix by Koven.